From left: Caguas Mayor William Miranda-Torres and Carlos Toro, president and Oscar Super Cash and Carry. Caguas-based Oscar Super Cash & Carry announced Tuesday it will make its resources available to business incubators to serve as a platform for social innovation to strengthen smaller businesses and in turn, the foundation for Puerto Rico’s social and economic development. The initiative aims to be model for other businesses to foster a “robust” entrepreneurial class of micro, small and medium businesses. “To keep the island going, stronger entrepreneurs have to be in solidarity with emerging ones to ensure that all of the links in the business chain are standing and firm” said Carlos Toro, president and Oscar Super Cash and Carry, a company with more than 40 years of experience in the local business community. The company signed two collaboration agreements with the Municipality of Caguas and the Alliance for the Incubation of Solid Community Microenterprises, known as AIMECS, committing resources to encourage budding entrepreneurs. As part of the collaborative agreements, Oscar Super Cash & Carry will offer monthly workshops on business issues for AIMECS participants and the business ecosystem created by the Caguas Department of Economic Development and Caguas Emprende. It will also provide mentoring for one year to a microenterprise from Caguas Emprende, and will provide $1,500 to another microbusiness incubated by AIMECS. 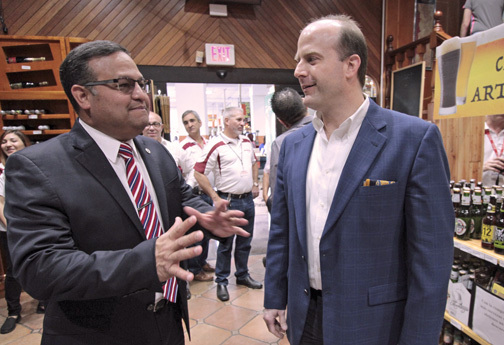 “Given the crisis affecting the island, the Municipality of Caguas continues to take the lead with economic development strategies. In this effort, our small and micro businesses are an essential part of it,” said Caguas Mayor William Miranda-Torres. The agreements were signed during the 8th Food and Trade Show by Oscar Super Cash and Carry, an event in which suppliers offer and guarantee visitors special prices for a month for their best products. Hey Buddy!, I found this information for you: "Alliance born to boost social innovation, development". Here is the website link: https://newsismybusiness.com/alliance-innovation-development/. Thank you.